Teenager Shaun McWilliams could be in line for his first Cobblers start in Saturday’s crucial Sky Bet League One clash at relegation rivals Bury. With John-Joe O’Toole suspended for the trip to the north west following his red card in Easter Monday’s 1-1 draw with Shrewsbury, Town boss Justin Edinburgh will be forced to reshuffle his midfield pack to take on the Shakers. Sixfields youth product McWilliams, who is just 18, has been a regular on the Cobblers bench in the past few weeks, and has come on and played on three occasions. The past two times he has been sent into the firing line, against Sheffield United and the Shrews, Edinburgh has preferred the youngster to the more experienced Jak McCourt. With O’Toole out, Luke Williams injured and Hiram Boateng having failed to truly impress, it could be that McWilliams is handed his full debut. And although it will be a high intensity, high pressure occasion. Edinburgh admits it is something he is seriously considering. “Shaun is very much in the forefront of my mind,” said the Cobblers boss. “We have bedded him in, and I think as long as he doesn’t get carried away, and we will make sure he won’t, and works hard then he has got a chance. McWilliams is certainly match ready as he spent a large chunk of the season playing in the Evo-Stik Southern League Premier Division at King’s Lynn. Since being recalled to Sixfields, he has has clearly impressed Edinburgh, not only with his first team preformances when called up as well as his efforts training, but also with his attitude,. And the Town boss believes a good attitude is absolutely crucial. “Shaun is the modern day player, he is athletic, he is competitive and is comfortable in possession of the ball as well,” said Edinburgh. “He has a bit of everything, and we have to make sure that we continue to ground him which is the big thing for me for young players these days. “Unfortunately, what we are getting is that players make one or two substitute appearances and feeling they have become a seasoned professional, and that’s where I feel it’s going wrong. It could be that McWilliams and McCourt are both recalled to the midfield, with McWilliams doing a good job on the left flank in front of emergency left-back Aaron Phillips to stem the Shrews attacking flow following Dave Buchanan’s sending off on Monday. That would then open the door for McCourt to play in the centre alongside Matt Taylor. Phillips is again likely to take up the left-back spot in Buchanan’s absence, the first time since May, 2015 that Buchanan has not been available to start a Cobblers game! 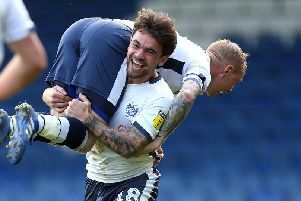 “I thought Aaron did well when he came on against Shrewsbury, and he is somebody we will look at for the weekend to go in there,” said Edinburgh, who was himself a left-back as a player. So, from experience, is it easy for a full-back to switch flanks? “It’s not something that is familiar, but it is something that you can deal with,” said the Town manager.